Are you a Dragon Ball Z fan? Did you miss it when it came to UK cinemas in 2015? Did you want to see it in 3D then? If you can answer yes to any of the questions then I have great news for you. The film is coming back to UK cinemas. This time in 3D but on the downside, it’ll be only in cinemas for one day only. 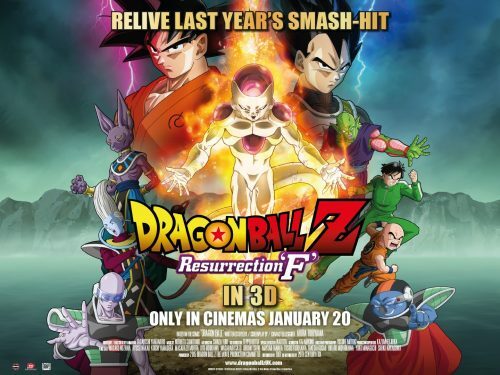 Dragon Ball Z: Resurrection ‘F’ is the second film to be personally supervised by the creator of the series, Akira Toriyama. The movie features the return of Frieza – widely hailed as one of the most iconic villains of all time. Even the complete obliteration of his physical form can’t stop the galaxy’s most evil overlord. After years in spiritual purgatory, Frieza has been resurrected and plans to take his revenge on the Z-Fighters of Earth. Facing off against Frieza’s powerful new form and his army of 1,000 soldiers are Goku and Vegeta who must reach new levels of strength in order to protect Earth from their vengeful nemesis.